This is the second of two parts of our EMH 2019 conference review. 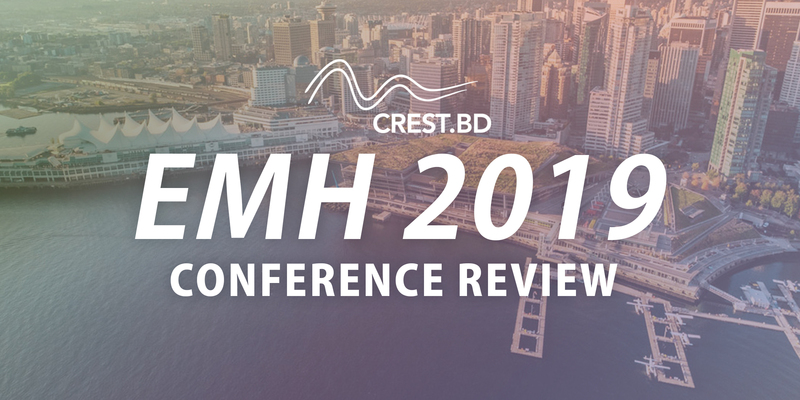 For an introduction of the conference and reviews, highlights, and photos of Day 1’s workshops and events, please visit crestbd.ca/EMH2019. 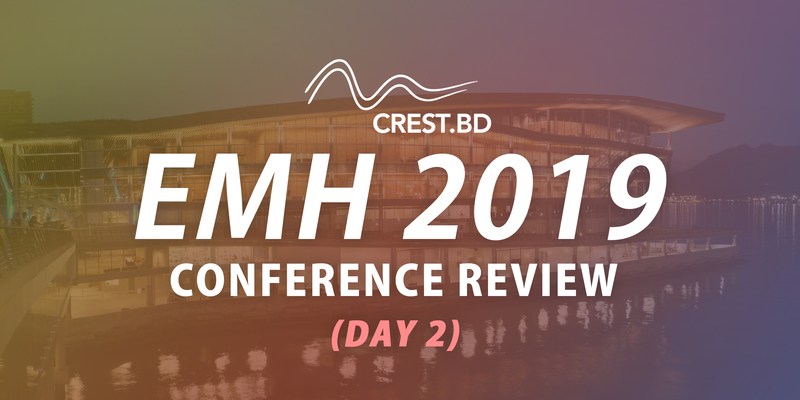 For Day 2 of our EMH 2019 conference review, we review four select presentations. Damon began his talk by describing the landscape of EMR (Electronic Medical Records), through the philosophical lens of “Absurdism”. He defined technology as a dichotomy between the connection and non-technical, as described by Elder Woody Morrison, in the afternoon, and the potential for technology to improve patient care. This dichotomy is “absurd”, since technology has the potential to both destroy and enhance patient-physician relationships. The focus of his talk was resolving this relationship. In addition, he emphasized the importance of patient-generated data and how the emergence of “disruptors” like Apple and Amazon need to be balanced with information on what the physicians and patients need. The synthesis between large companies and patient care occurs when we focus on empowering patients through EMR-generated data. Only then can we reach the equilibrium between the power and the dangers of technology. Dr. Jankowicz echoed Dr. Ramsey’s sentiments in how EMR technologies need to move towards “radical transparency”. He discussed the trajectory of his EMR creation, discussing that failures occurred “whenever we didn’t sit side by side with physicians”. One specific paper that he cited was “Computational psychiatry as a bridge from neuroscience to clinical applications” by Huys, Maia and Frank, which echoes the challenges and opportunities of combining Artificial Intelligence with psychiatry today. Specifically, the paper alludes to the fact that data-driven approaches have the potential to apply machine-learning methods to improve classification of disease, predict treatment outcomes or improve treatment selection. This meaningful potential of combining physician-input with machine-learning was where Dr. Jankowicz saw the potential of EMR systems in the upcoming years. Written by Zamina Mithani, a fourth year Sciences student, enrolled in a Directed Studies course with Dr. Erin Michalak and Dr. Jill Murphy on projects related to Digital Mental Health and Implementation Science. Zamina has also previously worked for InputHealth and is passionate about systems that prioritize patient data and security. Extremely relevant to the mission of CREST.BD in supporting student in their post-secondary journey towards mental health care. Dr. Levinson started with a brief overview of the emerging adult population, and post-secondary students. She cited huge opportunities for EMH in this space. A few of the reasons for increased demand for mental health services is higher numbers and increased proportions of youth from more diverse (racial, religious, economic, and gender) backgrounds. In addition, prior to post-secondary schooling (PSS), youth coming from international backgrounds may have not received necessary or appropriate MH care, related to individual, family of system factors. There can be increased stigma against these individuals based on the fact that mental health services in their foreign university is less accessible or affordable for them. The care during PSS is often improved from previous experiences before entering university. Counseling appeals to youth, and on-campus services are often preferred or better funded/covered compared to community services. At the same time, multiple barriers also exist: these include the increased tuition fees of PSS and more students working at part-time jobs which can increase financial and academic stress. Moreover, the standards for schools and curricula are increased, and the years in high school often do not adequately prepare students for the kinds of academic, social, and financial demands of university life. This can lead to increased loneliness and stress — an epidemic within the PSS demographic. To address this need, Dr. Levinson discussed the crowd sourced digital platform that is being created at the University of Toronto, that has an open-sharing of knowledge of resources, exploring support options and evaluating the reviews of services. Users can also use this platform to electronically locate mental health and wellness spots on campus. She also discussed the university’s “stepped care model for mental health”, where her team has launched a successful online CBT program for students. This includes the IAR platform which allows the university to provide better care for its students. Overall, the segments on student mental health and EMR technologies were honest and refreshing perspectives of the real challenges that corporate and research leaders face in ensuring that solutions are relevant and effective. Relevancy is especially key: partnering with patients, physicians, and researchers is a necessary component of ensuring that the technologies really address mental health issues. This can be especially difficult when factoring in age, culture, accessibility, and the user-friendliness of these technologies. All three presenters showed a keen awareness of the limitations and opportunities of current technologies and showed humility in persisting, through clogging code and demo-ing data, in finding technology solutions that benefit physicians and patients. This session was led by Dr. Joanna Henderson from the Centre for Addiction and Mental Health (CAMH) as well as Jacquelin Relihan from CAMH’s youth engagement group. They shared some very compelling insight regarding the importance of involving the youth when creating any mental health services. They began their talk by discussing the lack of specific literature currently available pertaining to youth engagement, which challenged them to look across different literature to better understand how to do this work efficiently. Across all different disciplines, whether it be health research literature or youth service literature, there is clear evidence of the reciprocal benefits that arise when individuals are included in the development process of their care. They also discussed how research has shown that young people experience enhanced aspects of mental health functioning, which further reinforces the need for engaging this particular demographic in the development of mental health services. A lot of their work has focused on establishing what they refer to as a “youth-adult partnership”, where the adults and youth are operating based on a joint vision, work, and set of values. The partnership runs upon several principles such as community connectedness, allowing the youth to actively participate at the center of collective decision-making rather than at the margins, and natural mentorship. In this way, everybody involved in the development of these services is seen as an equal member bringing different expertise to a complicated problem, rather than the traditional model which assumes that the researchers (or “experts”) are the only ones that can provide meaningful insight. Dr. Cornish’s talk was centered around the “Stepped Care 2.0©” model, a “collaborative system of delivering and monitoring programs, while promoting client responsibility, autonomy, and resilience”. He was very passionate about his efforts to find a system that can radically transform the current mental health systems in place, inducing better access to care and improved outcomes. According to Dr. Cornish, while tech can be very useful, it is merely an enabler and not an actual solution to the current problems in the mental health system. He believes that the design work needs to happen first, in order to organize all the different components involved in recovery and understand where all the pieces fit. Stepped Care 2.0© places emphasis on the participant’s readiness for change, rather than the severity of symptoms. He emphasized the importance of determining what the client is ready to do, rather than telling the client they should be doing based on their symptoms. The model also includes a large face-to-face or online component designed to meet clients over diverse locations (with the aim of increasing the access of care. Referring to the model as an “un-ending pilot”, Dr. Cornish emphasized the importance. A a step-by-step walkthrough of Stepped Care 2.0 PowerPoint is accessible here: steppedcaretwopoint0.ca/knowledge-translation.